The expression, “Change is the only constant” is no longer hard to comprehend. Every business now recognizes the importance of adaptability and innovation. What may be overlooked, however, is a full examination of how a business’ operations are equipped to reliably and competitively deliver quality products in the midst of changing market drivers. With TPM, Laszeray will reduce costs by increasing the life of its assets, by eliminating the need for rework, by reducing costs associated with replacement parts, and by preventing disruptions. It is not easily accomplished. Successful implementation requires Kaizen events, vigilant observation, meticulous data collection, and 5S behavior. 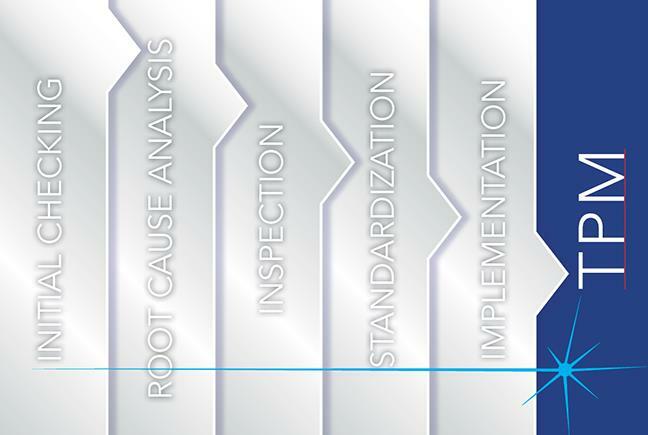 Root cause analysis: Determine source of leaks, spills, etc. When TPM works, all team members adhere to a system that incorporates inspection, participation, ownership and data collection. The results are measureable. They include cost savings, increased output, improved quality, reduced capital expenditures, and lower maintenance inventories.